A high potency, patented presentation of this well-researched extract in a base of alfalfa, spirulina and bilberry. Combine with a Viridian Synbiotic supplement. 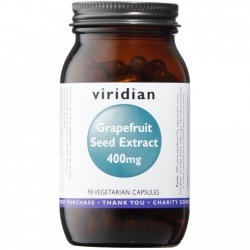 Grapefruit seed extract (Citricidal) 400mg,_in a base of alfalfa, spirulina and bilberry.